We’ve rolled out some interface updates to the Splits Leaderboards. The biggest change is the addition of quick splits and a ribbon control interface. The quick splits represent the most frequently used splits: home/away, handedness, and starting pitcher/relief pitcher. To keep the control area of the board condense, we implemented a ribbon / tabbed interface for the controls. If you would still like to see everything at once, you can click “Show All”. The data export button has been moved closer to the data grid and will now export only the data and stats on the current board. We are in the process of designing more data features and stats for this board. And if you notice any bugs or errors, please let us know. 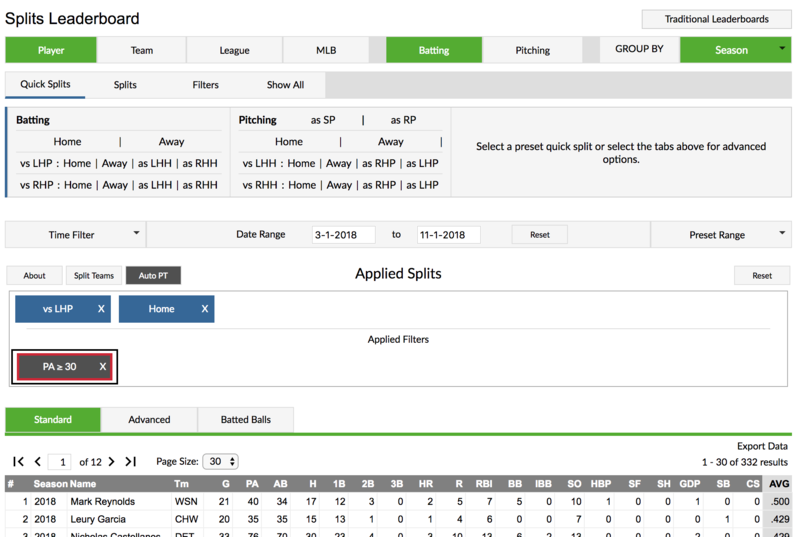 We hoped you liked reading Interface Updates to Splits Leaderboards by Sean Dolinar! Having weeks and months sort chronologically instead of alphabetically would would a nice fix.